By Dr. Martin Kessler, State University of New York at Albany and Dr. Robert B. Shaw, Clarkson College of Technology. One of Potsdam’s historic landmarks, now almost forgotten, was the house of worship of the Catholic Apostolic Church which stood facing Pine Street on the corner of Maple Street where a [Texaco] service station was until recently located. The Catholic Apostolic Church originated in the British Isles. In the winter of 1829-30 Edward Irving, minister of the Scotch (Presbyterian) Church, Regent Square, London, delivered a series of lectures in which he asserted that the spiritual gifts alluded to in the New Testament (particularly speaking in tongues and prophesying) were still relevant to the present time. About the same time miraculous healings were reported at Port Glasgow, Scotland, and were found to be genuine. In 1833 Irving was deposed from the ministry of the Church of Scotland for heresy. A new movement had been born, the leadership of which would soon pass into the hands of “twelve Apostles”, and the nature of which reflected Anglican more largely than Presbyterian tendencies. From the standpoint of local history, it is of considerable interest that the Potsdam congregation was the first of this denomination to be established in the United States. Its origins are obscure, however, two standard St. Lawrence County histories (those by Everts and Curtis) assert that the local church was founded in 1837 by two evangelists, “Card and Cuthbert”, who came here upon the invitation of a David Lewis. Card must be William R. Card of Edinburgh, who had been ordained an evangelist in the Catholic Apostolic Church in 1832 by John Bate Cardale, the “pillar” of the movement’s apostolic college in England; Cuthbert seems to have served as an evangelist in Kingston, Ontario. According to P. E. Shaw, Caird and George Ryerson were sent out as Catholic Apostolic missionaries from England to Canada in 1834. After an apparently unsuccessful mission, Caird was sent out again in 1836, accompanied by Cuthbert. 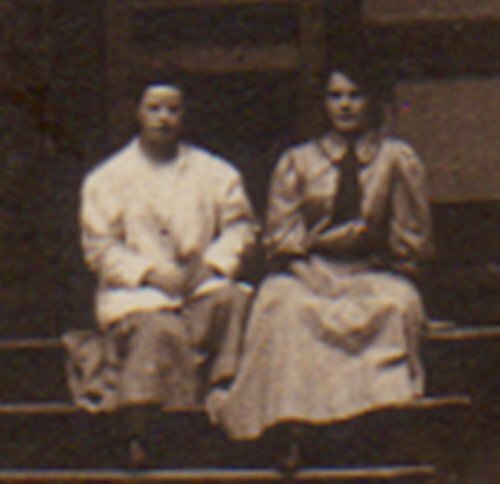 The two county histories seem to allude to this pair, though the source of their information and the circumstances of their coming to Potsdam are unknown. 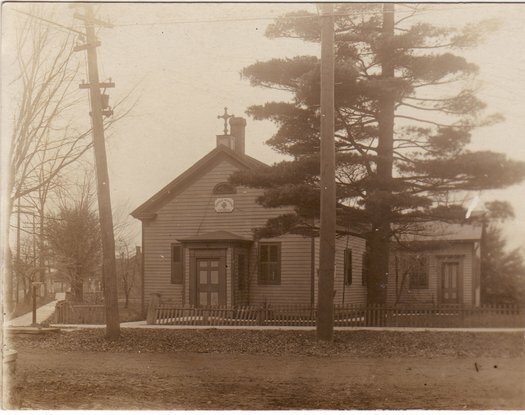 Shaw simply remarks: “The Catholic Apostolic Church soon made its appearance in the United States, and many responded to its message.” Potsdam’s proximity to Kingston, where the first Catholic Apostolic Church in Canada had been established makes it entirely possible that work was started here at a very early date, quite likely before New York City. If, as the histories indicate, 1851 is the date when the New York City church was founded (although public meetings were held there as early as December 1848), then the Potsdam church is prior, for William Watson Andrew’s coming to Potsdam in 1849 is well attested. However, the question of the relative priority of the Potsdam church can only be settled conclusively by access to relevant primary sources, either in Canada, or in the records of both congregations. The whereabouts of such data are not presently known. Another significant connecting link must be sought in the career of George Ryerson, a graduate of Union College, Schenectady, who had served the Grand River mission (Methodist) in Ontario as a probationer, and went to England in 1831 where he came under the influence of Edward Irving. “In a subsequent visit to Canada, he was instrumental in inoculating the Methodists of both Toronto and Kingston with the errors of Irvingism to a most disastrous extend,” writes John Carroll. Besides Kingston, two Catholic Apostolic congregations were founded in Toronto, one of which was served by Ryerson for many years. It seems likely that Potsdam was evangelized from the Kingston base. As mentioned above, the earliest date given for the founding of the Potsdam congregation is 1837. Elmer T. Clark erroneously gives 1851 as the date, with the New York City congregation established soon thereafter. Michael G. Barnett mentions a man named Lewis (probably David Lewis) who had a blacksmith shop on the corner of Maple and Pine, on the present  site of a Mobil service station. He writes: “This man Lewis built a little church across the street on the other corner where the Texaco station is now. This church was known as the Croaker church.” According to Everts’ HISTORY, “a small frame house of worship was erected in Potsdam in 1846…sometimes considered a branch of New York City, at other times of Ottawa.” Marguerite Chapman gives a date of 1843, with the additional information that the building was enlarged in 1874. An 1865 map of Potsdam shows both church and parsonage at the stated location. The U.S. Census of 1906 confirms that the first church of this denomination in the United States was organized in Potsdam,N.Y., and the second in New York City in 1851. The same census numbers 2,907 communicants nationwide. 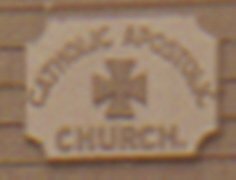 The New International Encyclopedia (1917) states that the Catholic Apostolic Church had 11 congregations in 1913 in the United States. Presently, besides the church in Manhattan, at 417 West 57th Street, which still holds services about every other week, there is a congregation in Chicago; these two seen to be the only congregations of this denomination operative in this country. The librarian of Emmanuel College, Toronto, reports that no congregations are listed in Canada presently. Clark’s comment that the “Irvingites,” as the adherents of the Catholic Apostolic Church are sometimes called, are an exception of the rule “that such groups take their rise among the ignorant poor” is also attested in the Potsdam congregation, whose members were often prominent and substantial citizens. Though membership records are not available, some members are known. One prominent family is the descendants of William James Sealy, born in London who came to Canada in 1821, and to Potsdam some time before 1862, where he died in 1878. He had three sons and three daughters. One son, William F. P. Sealy (1846-1928), served the congregation as its spiritual leader. He is also shown in old directories as a resident at 49 Maple Street and a “manager” at 22 ½ Market Street. He was superintendent of the Potsdam Water Works for 18 years and also an associate of Bertrand Snell in various activities. The 1924 Potsdam directory list the same Mr. Sealy as retired and living at 49 Maple Street. 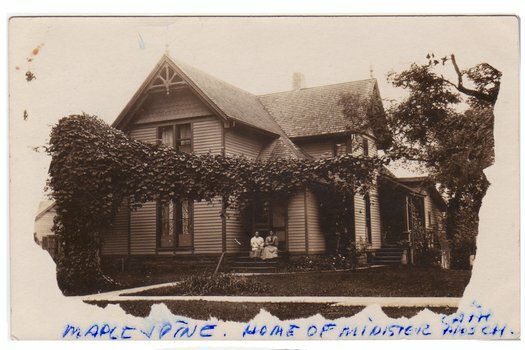 As recently as 1941 Mrs. E. Mae Sealy, “widow C. S.” (probably Clarence) was shown as still living at this address. Other prominent names among the membership included Dunlop, Elliot, and Bicknell. The church was legally dissolved as of March 9, 1894. Nevertheless the congregation remained intact, in some sense, for a few years longer. Apparently Mr. William F. P. Sealy bought the property (for $8,500) and lived in the parsonage, continuing to serve the church, although the title was transferred to the “Church Building Association of Potsdam” (Deed 142B, Canton Courthouse). Notice of this transaction appears in the St. Lawrence Herald for three weeks beginning 3 November 1893, David Lewis being mentioned as the sole surviving trustee. It seems that the building remained intact and services continued to be held. In fact, the last communicant was received into membership as late as 1901. 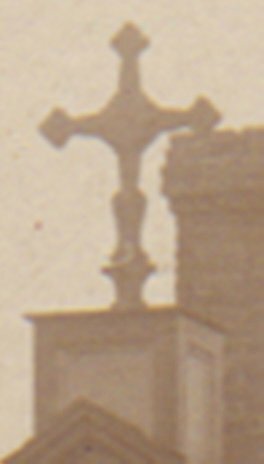 Mrs. Chapman has written that the building was torn down after December 1920, “when the church as given up.” No specific corroboration of this event can be found in the local newspapers. The Potsdam Courier-Freeman of 23 June 1920 announces the marriage of Bernetta Sealy (a niece of William F. P. Sealy) to Basil Elliot, of Tupper Lake. Mrs. Elliot still resides in Potsdam and seems to be the only surviving member of the congregation. Since the ceremony was performed in Trinity (Episcopal) Church in Potsdam, the Catholic Apostolic congregation must have disbanded prior to this time. Further, in the minutes of the final meeting of the leaders of the church, dated June 1922, the observation is made that the building had been torn down about five years ago; this would bring this event to about 1917. According to Mrs. Bicknell, the wife of one of the last surviving members (Herbert Bicknell, deceased 1971), the remaining parishioners were advised to join Trinity Church. The pews from the demolished church were stored in the loft of her father-in-law, Horsea Bicknell (who had been ordained a priest in 1879 and also served as president of the Potsdam Savings & Loan Association), on Market Street for a number of years. Some time in the early 1930’s, they were damaged by fire, and they were later donated to the Jewish Congregation, Beth-El. Dr. Leete, Potsdam Town Historian, reported in 1926 that the marble of the alter was broken up and buried. A listing of clergy which served the church is found in Everts’ HISTORY, but the information is quite indefinite. Cuthbert supervised the congregation for a year. Then, a Mr. Easton served as pastor for 1 ½ years; after that, Norman Holmes for about 10 years. Easily the most illustrious of this roster, and the one whose career is also most amply documented, is William Watson Andrews, who served Potsdam from 1849 to 1857. The name mentioned next is Noah Perrin, chief elder and acting pastor. He died in 1876. Quite inexplicably, the congregational records indicate Mr. Perrin as the “first priest” in the Potsdam congregation. A Mr. Britton served as pastor for 2 ½ years and Mr. Dunlop 1 ½ years. Precise dates and clerical titles are lacking, except for Mr. Andrews. When Everts published his HISTORY in 1878, there were 40 communicants, with George Lewis chief elder and acting pastor. Whether he was related to trustee David Lewis, mentioned above, cannot be ascertained. It is probably not accidental that more information is available on William Watson Andrews (1810-1897) than any other clergyman or leader of the congregation, in view of his eminent personal qualities both intellectual and religious. Born in Windham, Conn., the son of a Congregational minister who was a descendant who was a descendant of one of the settlers of New Haven in 1638, William entered Yale at the age of 14, taught school the following year (because of financial exigencies), re-entering Yale at the age of 18, where he distinguished himself in English composition and debate. Two Yale classmates became his lifelong friends: Noah Porter, who later became President of his alma mater, and Lynn Hotchkiss Atwarter, who taught logic at the College of New Jersey. Although William had always thought of studying law, he was strongly influenced by the religious ferment of the 1830’s. At this time England witnessed the Oxford movement and the rise of Anglo-Catholicism, both of which had been nurtured to a great extent by the Romantic protest against 18thcentury rationalism. Little wonder that Andrews was occasionally questioned as to whether he, too, would join John Henry Newman and others who returned to Rome. His answer was always in the negative, however. Early in his ministry he was invited to join the Pastoral Union, a group which had been formed to defend what they considered an orthodox theological position. Although Andrews generally sympathized with this, he declined to join for reasons which strike a keynote of the Catholic Apostolic movement. The church, he felt, is God’s institution, who has given it in its fourfold ministry of apostles, prophets, evangelist and pastors (angels as they were called in the Catholic Apostolic Church) every needed means of defense. Thus voluntary man-made associations (such as the Pastoral Union) are not God’s way to do His work. Instead, the church should rely in the carrying-out of its mission in the world wholly on the divinely-ordained means; in addition to the fourfold ministry, the church should recover the spiritual gifts (charismata) described in the New Testament. Undoubtedly one of the most striking features of this movement was the reconstitution of the Twelve Apostles. For a full, systematic discussion the reader is referred to the volume by P. E. Shaw, listed in the bibliography. Andrews, one of the most significant intellectual leaders of the movement in America, was not only critical, but also appreciative of the Roman Catholic and Reformation positions. By 1838 he was already being accused of “Irvingism.” The same year he met George Ryerson, who served under the Apostles. In 1840 he visited Kingston, Ontario where his ideas about church organization was rounded out. Three years later he visited for two weeks with Henry Drummond, one of the leading Apostles, at Albury, England. 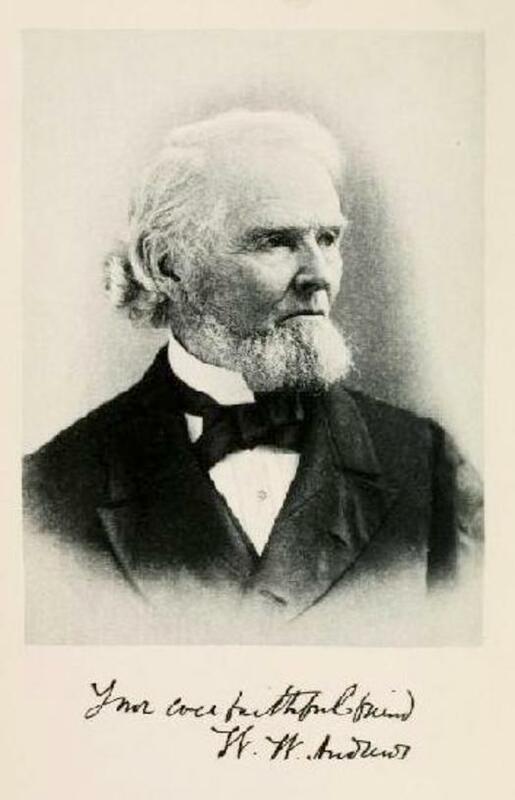 In spite of brotherly advice from good friends (such as Noah Porter and Horace Bushnell), Andrews persisted in his views which eventually led him to resign his beloved Kent pastorate to serve under the Apostles, who sent him to Potsdam in the fall of 1849. Andrews went to work in this community with much courage. Every Sunday morning Holy Communion was celebrated with a short homily; in the evening there was evening prayer with “pastoral teaching.” Special services were held on feast-days. For a time, the congregation and its minister were viewed with much suspicion. Andrews often felt lonely and depressed, particularly wince his wife had died the year before he came to Potsdam, while his children had to be cared for by relatives. Despite this change in denomination, Andrews retained a wan affection for his early Parish in Kent all of his long life. In 1894 he gave an address at the Kent church at the 60th anniversary of his ordination. By that time, at the age of 84, he spoke of his “thankfulness to God for setting me here as your pastor in the [sic]. Andrews’ years in Potsdam were spiced by occasional visits to Connecticut (1851-1853) and one to Ohio (1855). Early in 1857 he left Potsdam, having been called to be an evangelist, an office he filled until his death. This attitude could also be said to epitomize the movement which he represented. When the Twelve Apostles of the new denomination were appointed, it was expected that they would survive the return of Christ. In 1855 the first Apostle died (Thomas Carlyle); by 1907 none survived. Though a split developed on the question of apostolic succession (the NEW Apostolic Church appointed additional apostles to fill vacancies), the Catholic Apostolic Church attempted to hold its own without the benefit of its earlier inspired leadership. The movement cannot be understood, however, without appreciating its vision: the recovery of apostolicity and catholicity, including the charismatic gifts mentioned in the New Testament, set in a tradition which borrowed heavily from Anglicanism, against the expectation of the imminent Second Coming of Christ. It seemed a natural step for members of the Catholic Apostolic Church following its disbandment to join with the Episcopal Church, Father Pennock, present rector of trinity Church, reports that the church was strengthened considerably by this welcomed influx of perhaps two dozen or so new members.